Stuff boring old-fashioned peppers! There’s a new sheriff in town – pretty, pointy Ramiro peppers with thin skins that don’t need to be pre-cooked before stuffing. As an alternative to bland rice and mushrooms, fill your peppers with tiny, tasty, colourful treats like capers, tomatoes, olives or walnuts... and arrange lovingly, just as you’d fill a tiny Christmas stocking. If you don’t have the pointy peppers, the regular ones will also work just fine too. Halve the peppers lengthways and carefully remove the seeds and pith. Cut right through the centre of the stem if you can, so that both pieces have a pretty top. 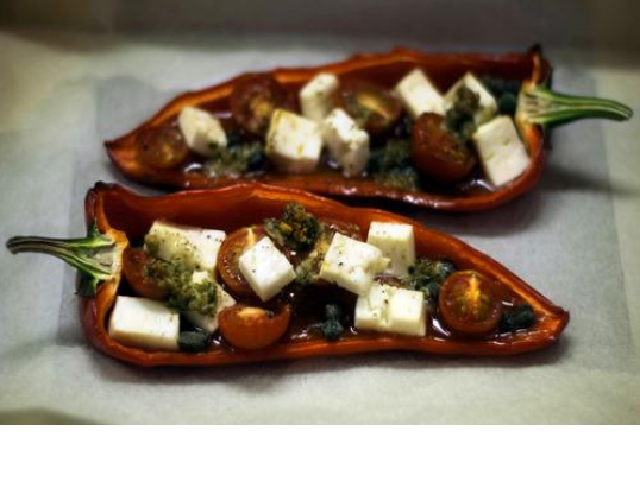 Place the peppers on a baking sheet lined with parchment and fill them with your choice of cheese cubes, capers, nuts, olives and tomato halves. Don’t be tempted to over-fill them – it’s nice to get something different in every bite. Blob a little pesto, tapenade or sundried tomato paste on top. Finally, drizzle a little olive oil over each pepper – this is important as it will help to stop anything from catching and burning in the oven. Bake the peppers for 10-15 minutes, until they are softened but not collapsing. The skins of the tomatoes will pucker and everything will start to get a little browner around the edges. Then they’re ready to eat – serve warm or cold, on their own as an elegant light meal or starter, or add some fresh green salad, cooked grains or pasta on the side. What’s the point of saving more food? Because every mouthful matters. We’ve taken a personal look at what you and your family can do to save more.